Our greenhouse products are available at the farm, at farmers markets, through CSA membership, Sacramento Food Co-op, Briar Patch Co-op in Grass Valley, Sunrise Natural Foods, Elliott’s (El Camino), Sunflower Market, Roseville & Sacramento Robek’s juice bars, Raley’s Markets, & local Whole Foods markets. Please call our office for wholesale price and distribution. wheatgrass is a one of the best sources of living chlorophyll. modern science shows that chlorophyll halts the growth of unfriendly bacteria. 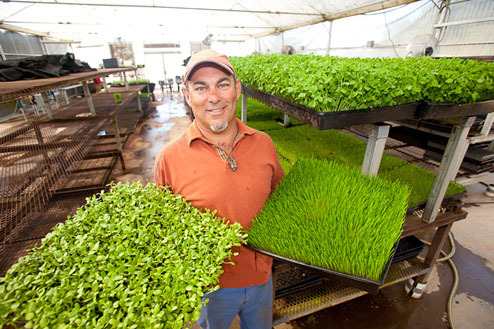 wheatgrass cleanses and rebuilds blood to carry oxygen to every cell of your body! This is important. .
chlorophyll supports and purifies the liver. chlorophyll improves blood sugar balance. wheatgrass can help cleanse the body of heavy metals. According to Ann Wigmore, founder of wheatgrass healing and the Ann Wigmore Institute, “wheatgrass juice is an effective healer because it contains chlorophyll, all minerals known to man, vitamins A, B complex, C, E, & K. It is extremely rich in protein – with 17 amino acids.” As you can see, this is amazing. Wheatgrass, with the amazing component of chlorophyll, cleanses, purifies, rebuilds and supports life.